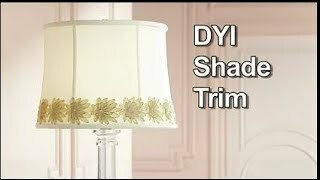 It's a simple DIY project to accent any lamp shade with this beautiful looped pattern shade trim with metallic silver thread. 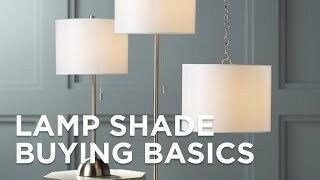 Our selection of lamp shade trim allows you to add a designer look to any shade. This design comes in a looped pattern and is fashioned from beautiful metallic silver threads. The four yard length of trim can be easily cut to size and glued in place using permanent clear fabric glue. Glue can be found at any fabric or craft store; just make sure it's a type that dries clear. Trim can be used for top or bottom trim. Mix and match with our other trim choices to create a true custom look. Looped pattern shade trim with metallic silver thread . 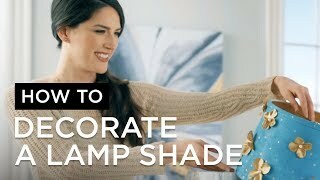 Use to create your own custom lamp shade. Glue in place with permanent clear fabric glue. Shade as pictured not included.